Harddance music is rising out of the underground into the international mainstream. On the forefront of it is D-block & S-te-Fan. This energetic Dj-duo has been the co-founders of the harddance as it is right now; Energetic, melodic and powerful. They showed their talent multiple times over the last couple of years which resulted in numerous hit records as: Music made addict, Rockin ‘ ur mind, Sound of Thunder, Ride with uz and the Magical mystery. Born as Diederik Bakker and Stefan den Daas, they decided to become D-Block & S-te-Fan in 2004 when they met in a local record store. From that moment on their unique and melodic sound got picked up by all the artists representing the harder styles in dance music. They have been releasing on the record labels of; Dj Dana, Dj Luna, Dj Isaac, Dj Zany and Dj the Prophet before they decided to develop their musical vision on their own label: Scantraxx Evolutionz. Their catchy sound and stage-performances didn’t go unnoticed. They got picked up by all the big organizations promoting Harddance which resulted in many main-performances from 2006 till date. To name a few: Decibel(50000, 5 years) DefQon(40000, 4 years) Mysteryland(65000, 3 years)Qlimax, Gelredome(30000, 3 years) on which they provided the anthem in 2009. 2010 brought them to their ultimate goals. By getting asked for January 2011’s X-Qlusive DBlock & S-te-Fan was their dream coming true. This solo event, which takes place in the Heineken Music Hall (7500) in Amsterdam. 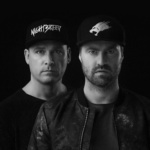 In preparation to this event they did an anthem for 10 years of Q-Dance, a party held in the Amsterdam Arena (40000) and were the closing act of Mysteryland (65000). With huge demand on tickets they organized a “running up” party in Rotterdam’s Outland(3200) which got sold out for the first time ever on a special night about a Harddance artist.